Superior 3/4" oval hole mesh prevent creosote buildup. Customs sizes and 5/8" mesh are also available. CCFSC4 4" ROUND COPPER LINER TOP CAP 3-7/8" O.D. CCFSC5 5" ROUND COPPER LINER TOP CAP 4-7/8" O.D. CCFSC6 6" ROUND COPPER LINER TOP CAP 5-7/8" O.D. CCFSC7 7" ROUND COPPER LINER TOP CAP 6-7/8" O.D. CCFSC8 8" ROUND COPPER LINER TOP CAP 7-7/8" O.D. CCFSC10 10" ROUND COPPER LINER TOP CAP 9-7/8" O.D. 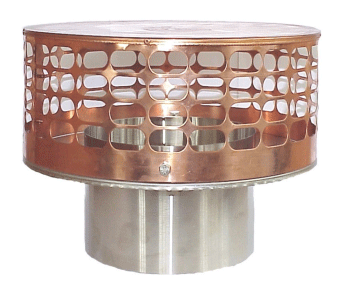 CCFSC12 12" ROUND COPPER LINER TOP CAP 11-7/8" O.D.